Emerging from a ‘painting fog,’ I am groping for clarity of mind to pull this post together! Painting and conversation don’t mix well, even if my conversation is with the keyboard! Attempting to catch up with Frizztext’s story alphabet, I present to you a wide variety of breakfast items from Ecuador. Desayuno by any other name would still equal breakfast! 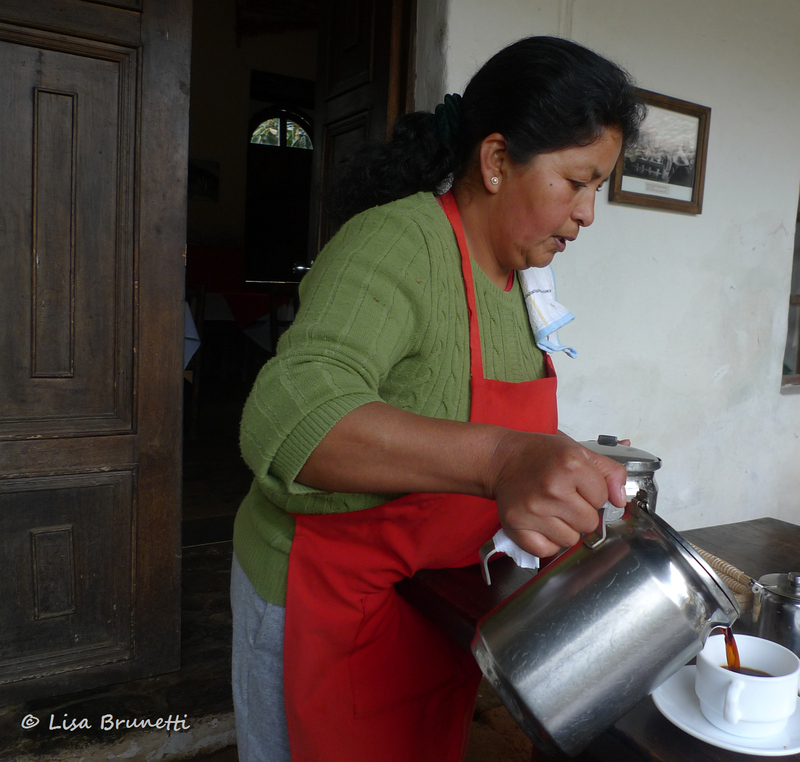 Breakfast at Hacienda Guachala, Cayambe Ecuador – One could become accustomed to this each morning! Breakfast/desayuno isn’t just for humans! The birds in the pond (below) were having an all-you-can-eat buffet of shrimp! Birds can quickly damage the yields of shrimp ponds, though the presence of egrets actualy tips the producer off that the shrimp are not well. Low oxygen levels often cause the shrimp to come to the surface, where the waders can do a lot of damage to the yield. I emailed the above image to my friends when I looked out the window and saw this early-morning raid! (Above) Leftover quinoa provides a jump start to an easy breakfast. See the post for “Quinouli Fritatta” HERE. A coastal remedy for hangovers is Encebollado. A cold cervesa is often suggested as part of that cure! Find out more about this ‘Tuna Soup’ breakast specialty HERE. 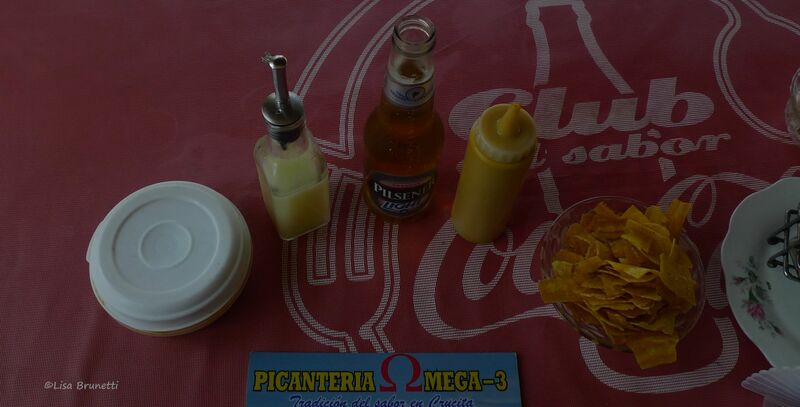 The Necessities for Encebollado: Chifles (Fried Plantain Strips) Fresh Lemon Juice and Cervesa! Street dining doesn’t sound too appetizing? Maybe I can tempt you with just-caught grilled tuna for breakfast? Desayuno = Breakfast;which looks most tempting to you? thank you! 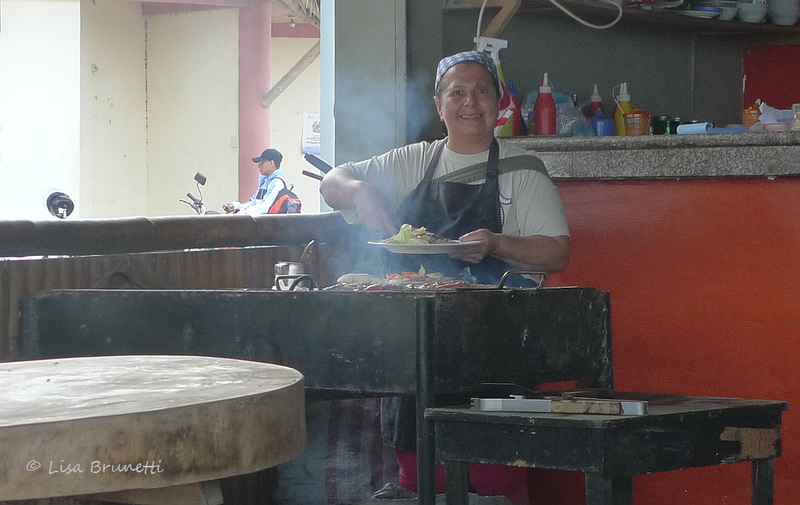 we’ve had more rain through the night, and a bowl of warm encebollado sounds wonderful right now! so does smoked fresh tuna! That coffee looks very good. Even the cat thinks so. 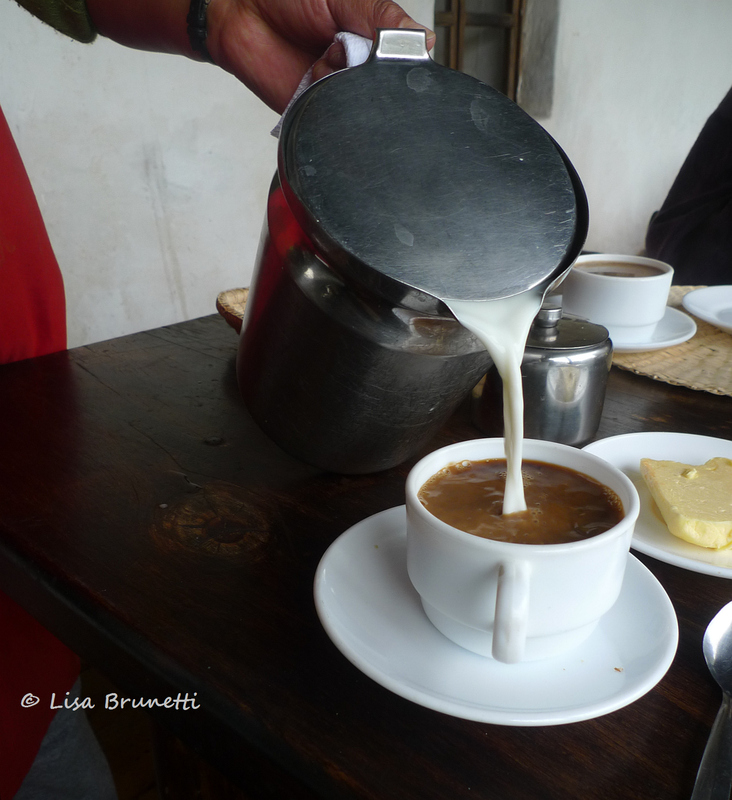 the ‘standard’ coffee in ecuador is instant coffee, so it’s always a treat when one gets deep rich comforting cup of ‘cafe con leche’ to start the day! I have brown bread with norwegian sweet, brown cheese for breakfast EVERY day, but as soon as I leave the front door and enter the world I can do anything for breakfast. But I might save the tuna for lunch. Nice post, Z.
thanks! i wasn’t sure if i’d like tuna for breakfast or not, but wow, is it ever comforting! 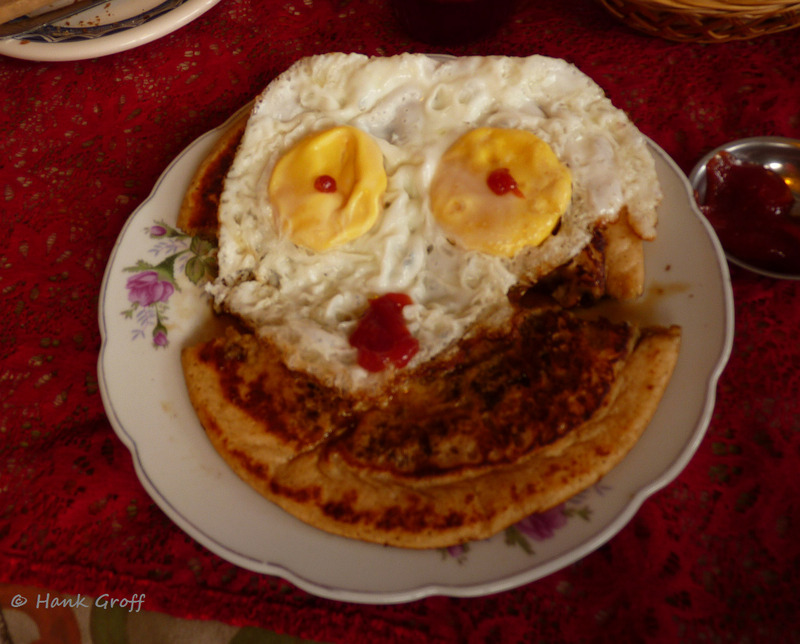 i have some friends who are not too crazy about having it for breakfast, and i have ecuadorian friends who have confessed that they’ve never tried it! brown bread and sweet brown cheese – sounds like a comforting way to start each day! the resident cat took my heart! oh yes, she would LOVE that for breakfast! so would I this morning! I love all the bright colors in your part of the world! ha! i painted til after midnight last night; since my last painting was basically earth colors, this new one will explode with color. i washed the lines of the entire 4 x 6 painting in yellow last night — yellow to represent the sun,which has basically been bashful this month! Quinouli frittata. Now that sounds good. great! i look forward to your post! What a fun post! Now I am ready to eat… though I am sorry to say, that after your post, my own desayuno will be a paltry beginning to my day. you advanced to the head of the class! A+ amiga! i have always preferred a robust breakfast with lots of protein. for some strange reason, however, eggs have always made me hungry a few hours later! my favorite breakfast was always in mississippi, when i’d go fishing at daylight, return to our cabin and clean the fish, the cook stewed tomatoes (from the garden) and biscuits and filet of fish! yum yum! i’ve never cared for anything sweet at breakfast – jellies and jams? nunca! – sugar makes me really hungry later, and sometimes makes me feel sick first thing in the morning! so, grasshopperette, wanna risk it all and attempt your second spanish word quiz for the day? nunca….. hmmm, what could that mean? i will forever treasure that moment which is burned into my memory! ‘never/not at all” i think the judges would agree that you aced another one! This was fun, Lisa! I hope we can ‘play’ this spanish vocabulary game again soon! we can thank frizztext with the weekly alphabet challege.. E rolls around tomorrow – hmmm, encebollado comes to mind… any suggestions for the letter E? you did a great job, and the oatmeal sounds wonderful! i approve totally! you are doing great! 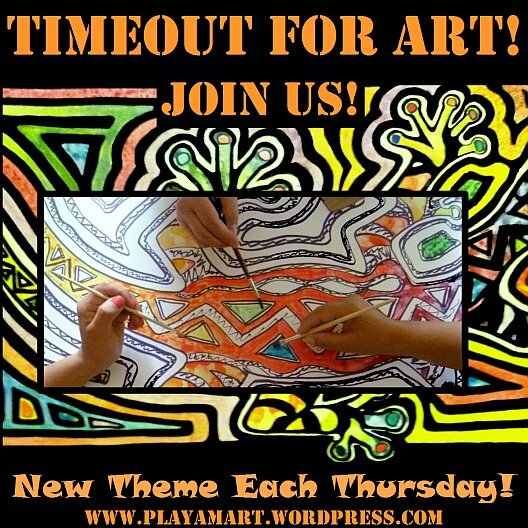 why not join us each week?!!! thanks! i’m about to catch a bus for san vicente and transfer to the pedernales/manta express… after immigraton appt tomorrow, i will probably hop manta express back as far as jama. abotu to leave now! you’re right! much better than boring breakfast!! Delicious desayunos. My stomach is growling. Do you like the quail eggs? they would also make cute appetizers! Mmmmm…me gusta cafe con leche para el desayuno! But what are Bolones? That’s the only thing I don’t recognize at all. 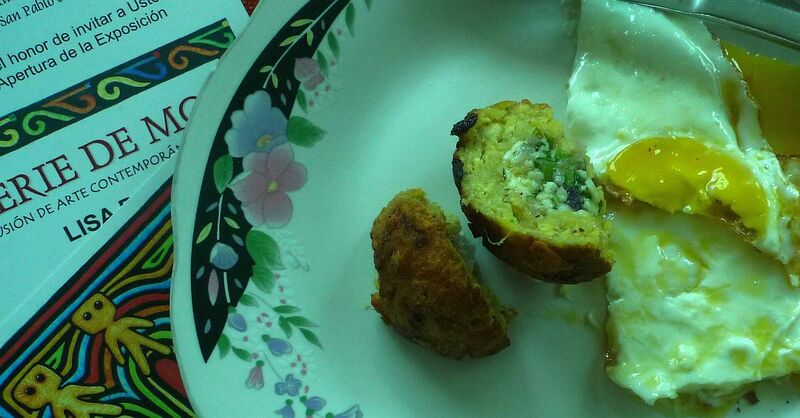 Had the quinoa fritata last night for supper…sorry, none left for desayuno. I could eat the grilled tuna anytime of day. I don’t like sweets (rolls, jam & jellies) in the morning either, but I do like my mango smoothie with pina colada yoghurt. yum yum yum! so glad that you enjoyed the quinoa! i try to cook much more than needed so that i can use the leftovers later in the week! mangos are one of my favorite fruits! ah! This was your recipe I used and yes,because of your suggestion, I cook more quinoa than needed.Our mango trees are loaded with buds and hopefully we’ll get a bumper crop this year. yum yum yum.. green mango salad…. ripe mangos every way possible! i always overdose when i’m in Costa Rica and the mangos are in season. i have four old trees that produce those huge mangos! the squirrels love them, and there are plenty for everyone, every thing. mango trees grow pretty fast there and usually bear ripe fruit around easter. Mmmmmm you are making me want to travel again! I love a good Latin breakfast! What a lovely post. I smiled throughout. Thanks for sharing breakfast with us! thank you for pulling a chair up to the table! that’s quite a contrast to your mardi gras warmups! I also love the life you described in your post. thanks.. and even if it’s not in balance all of the time, we try to adjust and find firm ground/footing! that cat gets around, doesn’t it?!!!!! thank you, although you win the prize on photographing your beautiful culinary creations! A delicious way to start the day! Mmm…. I was pleasantly surprised that I remembered that word from our days in Mexico. Loved your photos. Now I’m headed to the kitchen to see what is available! hey, yes, i could use a bit of nourishment as well. i was in transit for most of the afternoon and am now at a hotel near the beach-side restaurant that serves that grilled fresh tuna for breakfast! hmmmm. shall i have the complimentary breakfast or walk across the street and enjoy more fresh tuna? I discovered the pleasures of desayuno in Spain – but I was never served anything as exciting as these breakfasts you’ve shared with us. I’d go back to Spain just for the cafe con leche. 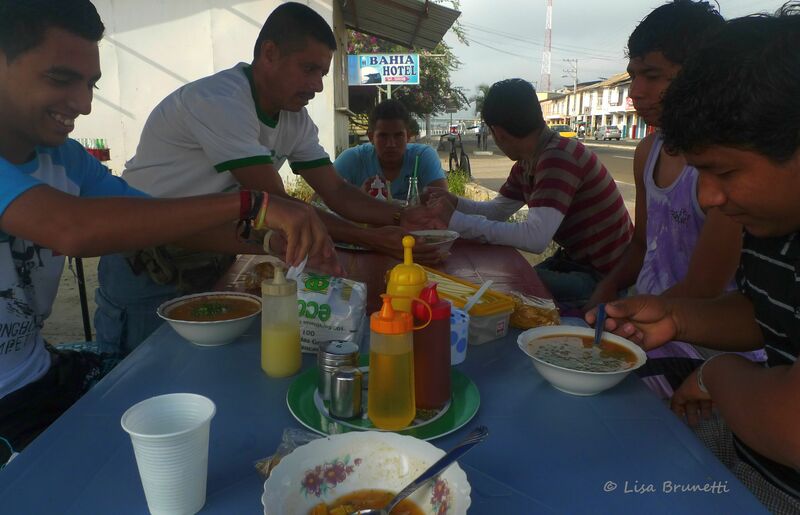 I’m very disappointed to hear that Ecuador serves instant coffee – Yuk its undrinkable stuff and I can’t imagine drinking coffee made with boiled egg water! I’ve never eaten tuna for breakfast, but if you’re offering freshly caught tuna at that street restaurant, I’ll be first in line. Encebollado looks like bouillabaise! A nice fish soup! I’ll have that too! thanks, rosie! your comment made me laugh more than once! 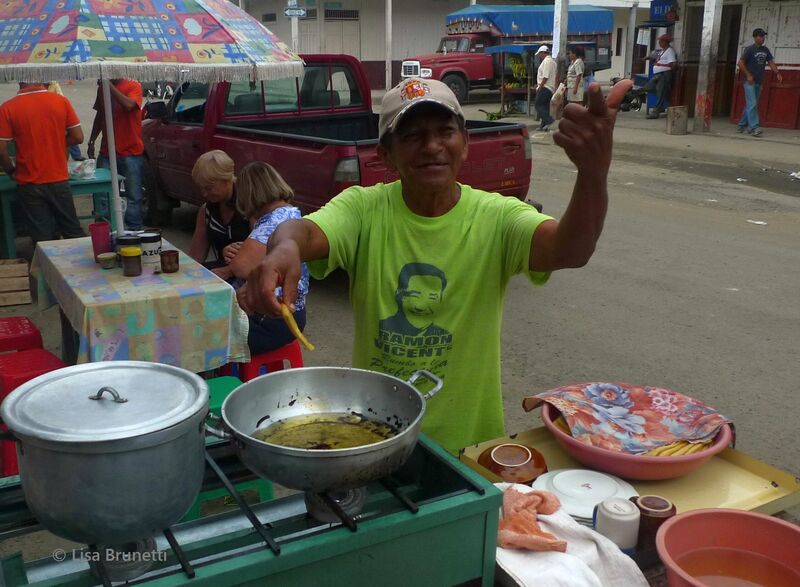 my little street cafe friend doesn’t usually cook eggs, though he volunteered to do that for us!!! i think i might use ‘encebollado’ for the ‘E’ challenge. ha! thanks so much! i had uploaded most of the images a few days earlier, and when i stopped painting and switched to that draft, i hit a wall. words fell flat, but they slowly found their way to the page! 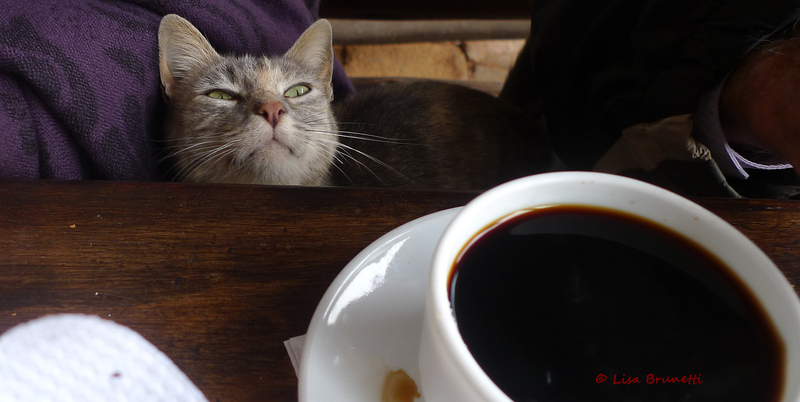 yes, cafe con leche is a nice treat; they heat the milk then add extra-thick coffee – yum yum, that will jump start one’s day! Quail eggs? Now that’s interesting. And aren’t they pretty? How many make a serving? Not one, surely. I couldn’t survive with only instant coffee – although I will say there’s an instant made in Mexico that’s pretty good. But morning starts with café con leche, and ends quite often with a little Bailey’s added (as it is now). The best coffee ever is either Cuban coffee in Key West or the wonderful stuff served up in a little café on Euclid Street in Berkeley… Ah, memories. But your breakfasts tempt even a non-breakfast eater. I tend to have my coffee first, and get going on the day. Then, about 9 or 10 I’ll have a little something. In summer, I do breakfast more often, because my day starts much earlier. Living by the sun makes a difference! earlier this week i walked to town in the mud.. caught a bus that was just about to roll out when i arrived at the bus stop.. in the next hub town, i transferred to a mini-van for the next leg of the journey.. then taxi across town to another high-class bus that took me to my final destination of the port city of manta. 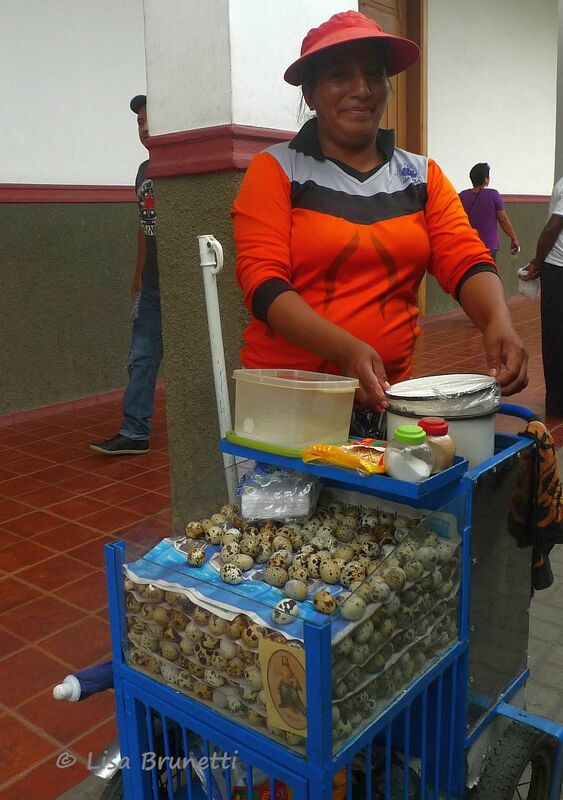 i spotted a lady selling quail eggs just outside of the terminal, so i asked how much, and they were ten cents each.. i handed her fifty cents, and wow, were those little orbs of warm sustenance ever perfect for a very hungry pilgrim!!! they were just enough to stabilize my blood sugar! i usually have an herbal tea first thing in the morning and eat later as well.